Ionic liquids (IL) have emerged as the next-generation “green” solvent that can replace traditional organic solvent due to properties such as high thermal stability and no vapour pressure. However, their increased usage inevitably allows them to find their way into the environment. 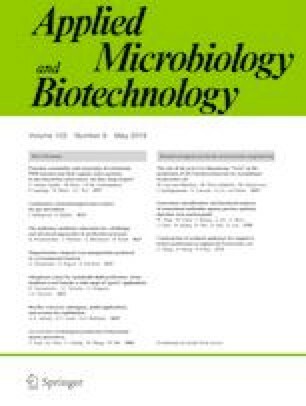 The objective of this study was to evaluate the role of autotrophic ammonia-oxidising bacteria (AOB) in the potential removal of 1-dodecylpyridinium chloride ([DPy]+Cl) in both short- and long-term studies. In short-term batch experiments, it was observed that a notable amount of [DPy]+ can be removed by the AOB culture with the removal mechanism being biodegradation and absorption, with the latter playing a greater role. It was also found that [DPy]+ can be released back into the liquid phase when AOB’s preferred substrate, NH3, was present. In the long-term study, [DPy]+Cl was successfully biodegraded and a total of nine transformation products were identified. The biodegradation pathway was also proposed. This study demonstrated that [DPy]+Cl can be biological transformed by enriched AOB culture and the accumulation of the by-product did not show long-term negative impact on AOB activities. The online version of this article ( https://doi.org/10.1007/s00253-019-09799-8) contains supplementary material, which is available to authorized users. This study received funding support from the Nanyang Technological University start-up grant—anticipating and mitigating challenges in enhanced biotreatment processes—enhancement and global warming.